Tamil Nadu's ruling AIADMK, which suffered a massive defeat in the Radhakrishnan Nagar (R.K.Nagar) by-election where votes were counted on Sunday, has blamed its debacle on the secret pact between opposition DMK and its sidelined leader T.T.V.Dinakaran who won the seat. In a joint statement issued here, AIADMK Coordinator and Deputy Chief Minister O.Panneerselvam and Joint Coordinator and Chief Minister K.Palaniswami said the secret pact between DMK and Dinakaran resulted in the latter's win. The statement said the people of Tamil Nadu are wondering as to how DMK was not able to secure even its committed vote share. Citing Dinakaran's statement that he was happy on hearing the acquittal of DMK leaders Kanimozhi and A.Raja in the 2G spectrum case, the AIADMK leaders said the DMK has given its votes to Dinakaran. Contesting as an Independent candidate, Dinakaran got 89,013 votes as against Madhusudhanan's 48,306 votes. The DMK's N. Marudhu Ganesh came a poor third securing 24,681 votes and also forfeiting the poll deposit. 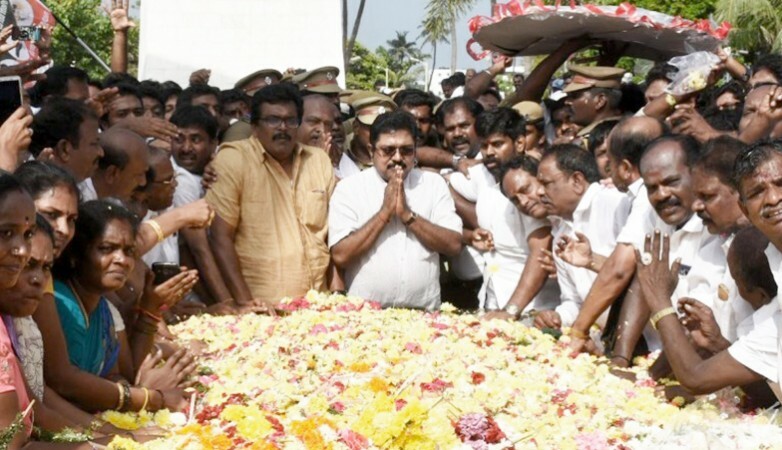 The R.K. Nagar constituency fell vacant after the death of its sitting member, late Tamil Nadu Chief Minister J.Jayalalithaa on December 5, 2016. The by-poll was held on December 21.